Founded in Leeds to promote youth work with girls in the city. We develop the first accredited training for youth workers. Already working across the West Riding, boys were allowed into the Association for the first time. Highfield House, a residential centre on Ilkley Moor was donated to the Association. We are one of a small number of organizations to pilot the new Duke of Edinburgh’s Award. We became a registered charity. We launched our first project delivered by Association staff; The 2-3-6 Project in Leeds. We deliver our first detached youth work. As a new county was born, we changed our name to West Yorkshire Youth Association. We bought our head office on South Parade in Wakefield. We launch a county-wide mobile young people’s advice service. In line with the expansion of our work to new areas, we changed our name to The Youth Association. We create ‘Youth Approved’, our young inspectors programme. Our Young Upstarts young people’s enterprise programme helps its first young business to start. We create Selfiesured, our innovative smartphone app for young people. 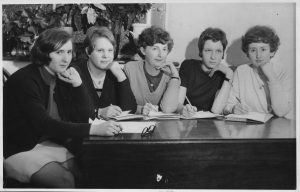 We were championing youth participation even in the 1960s, with these Bradford Members Council Officers. We are lucky that we have been able to keep copies of all our past annual reports and minutes going right back to our founding in 1904. They make interesting reading for anyone interested in the history of youth work and society’s changing attitudes to work with young people. Some attitudes and ideas have long since changed, but It’s surprising how many discussions and debates are still current today. 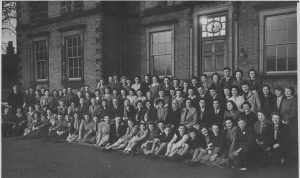 In 1945, these young people gathered at Tong Hall near Bradford.